The great strength of this routine's design is that the three cards are transported to their respective pockets by three different means. The first card gets there by the traditional palm-it-and-pull-it-out method. The second card gets there by means of the Bedwell jacket chute (or the Cornelius topit idea). The third gets there by means of Duffie's pocket switch swindle, (If you want to get technical, the first card relies on palming, the second on palming f>lus the jacket modification, the third on palming £lus the jacket modification the pocket switch swindle.) Each method camouflages the others. The spectators, following the natural tendency to seek one common explanation for what is apparendy one phenomenon, haven't got a chance. Finally, it's true that you can't show your hand empty before pulling out the first card the way you can with the other two. On the first card, however, you have the element of surprise going for you. 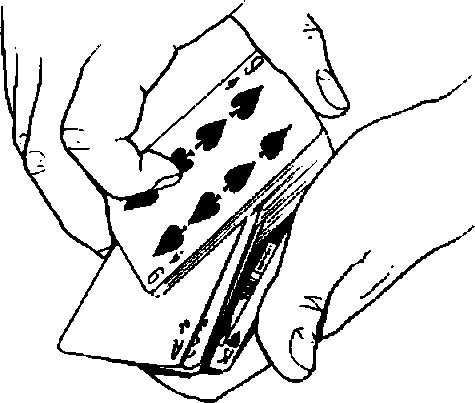 Furthermore, the ploy of relocating the card to the outer breast pocket means that, at the climax, all three cards are removed cleanly with empty hands. It's that final picture that the audience will remember. & Smart Money is, of course, an elaborated version of PocJwt Money. This raises the question; which is the better routine? The one I now use is Smart Money, 1 like the symmetry and rhythm of three selections. 1 also like the subtle combination of three different approaches as explained above. I think, however, that some readers may prefer the fact that, in Pocket Money, both cards are produced ultra-cleanly, with obviously empty hands. Furthermore, if you often find yourself performing for only two people (as restaurant workers, for example, often do), then, of course, you 11 get more use out of Pockét Money.